Caution this pic is scary Happy Halloween, & beyond. Mr Cole dining out at the Bank Of Anfield. An early day Ster£ing or Sanchez. Box Of Frogs Balotelli .... "I Am Special" Borini ....and Couldn't Hit The Corner Flag Lambert. How did we sink so low ? When Rodgers thinks Borini is going to be Torres 2.0 but he ends up being as potent in front of goal as Mignolet was a goalkeeper. I've got to admit, Rodgers and Hodgson are almost identical, just ones got a bigger nose and the other has character. ... and of course he told us that he had that three hour in depth discussion with Box Of Frogs before signing him .....to get into his head and understand him. 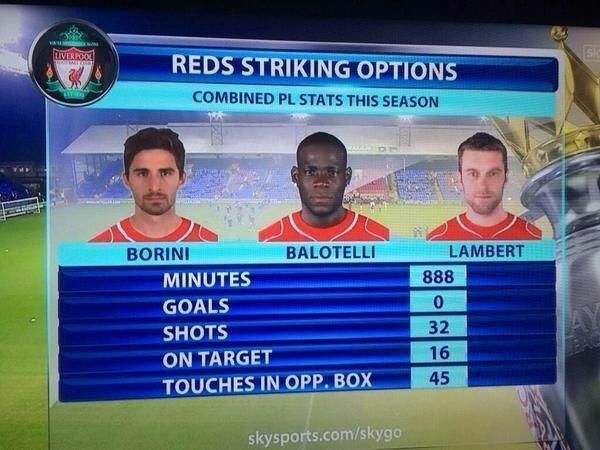 Haha both Rodgers and Borini must have been excellent in interviews. They must have been career advisors before they got into footy.